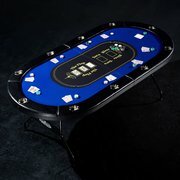 Inflatable Party Magic LLC is now offering an assortment of professional casino gaming tables. These tables are all top quality and have padding for comfort and a look of style. Each table comes with everything you need to play. You just supply the dealers and the players. We provide the tables and all needed equipment. 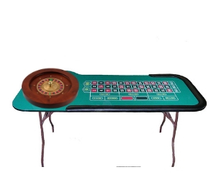 You can't have a Las Vegas style party without these gaming tables. If you are having an after prom, project graduation, corporate party, or just a casino style party with friends, you will definitely want to add these to your event rentals. Don't forget to add them to you holiday and company parties as well. 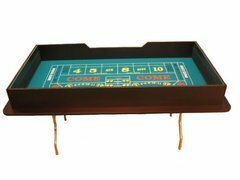 Black Jack Tables compete with cards, card shuffler, dealer shoe, and poker chips. Texas Holdem Tables complete with cards, card shuffler, dealer shoe, and poker chips. Craps Table complete with dice, poker chips, on/off circle, and dice stick. Roulette Table complete with Roulette wheel, wheel marble, and poker chips. 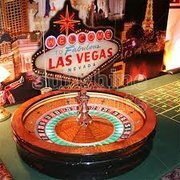 These tables are all you will need to complete your casino night fun. Simply click on the tables of your choice below and add to cart. Once all of your rentals are in your cart, you will follow the directions to book fast and easy online and pay your deposit. You will receive a confirmation email very quickly after placing your order. If you choose not to book online, you can contact us for assistance or to complete the order for you buy phone. We love helping our customers so please do not hesitate to contact us. Did you forget to add tables and chairs for refreshments or seating for your guest? Add our table and chair packages to save money. You can also add on a popcorn machine or cotton candy to keep your guests satisfied while playing games. A frozen drink machine can also complete the casino experience for your guests. A margarita can definitely add to your casino fun. Inflatable Party Magic has catered to the kids for years and decided that adults need to have fun too!